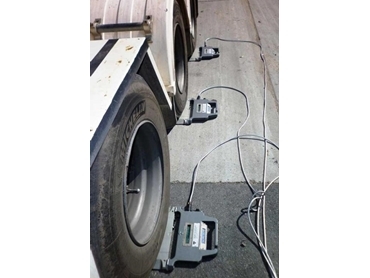 The Gold Coast City Council in Queensland is hiring a set of six truck wheel weighers from Accuweigh’s QWM branch in Brisbane to ensure vehicles carrying waste comply with legal axle load limits. The six truck wheel weighers are required by the Council to counter the large variances in mass of the waste being carted by the vehicles. The compacted waste is carried in large skip bins to the council’s landfill site, with each trailer being weighed by the truck wheel weighers to eliminate the possibility of overloading and consequently incurring fines. Under the Chain of Responsibility legislation, each and every person and company even remotely involved in the loading and transportation process can be held partly responsible and incur heavy fines. The truck wheel weighers were hired after the council ensured they were suited for the application at various sites. Accuweigh’s Road Guardian truck wheel weighers ensure that vehicle axle loadings comply with legal weight limits very cost-effectively. Leading Australian industrial weighing equipment company, Accuweigh operates eight branches across Australia providing complete service support on all truck wheel weighers, axle scales and weighbridges in addition to all types of scales and weighing equipment.